On May 25, the national food policy organization Food Policy Action Education Fund (FPA-EF) and its co-founder, celebrity chef Tom Colicchio, walked the halls of Congress with our nation’s top chefs and food waste advocates for a day of action on Capitol Hill. Their goal? Educate lawmakers about food waste reduction in the American food system. “Food waste is a more than $200 billion problem in America. It hurts the economy, our environment and our people,” said Tom Colicchio, food advocate, FPA-EF co-founder and “Top Chef” head judge. Food waste experts and advocates used data and insights from Rethink Food Waste Through Economics and Data’s (ReFED) Roadmap to Reduce U.S. Food Waste, released in March, to push for common-sense action that can be taken now to address this urgent and solvable problem. 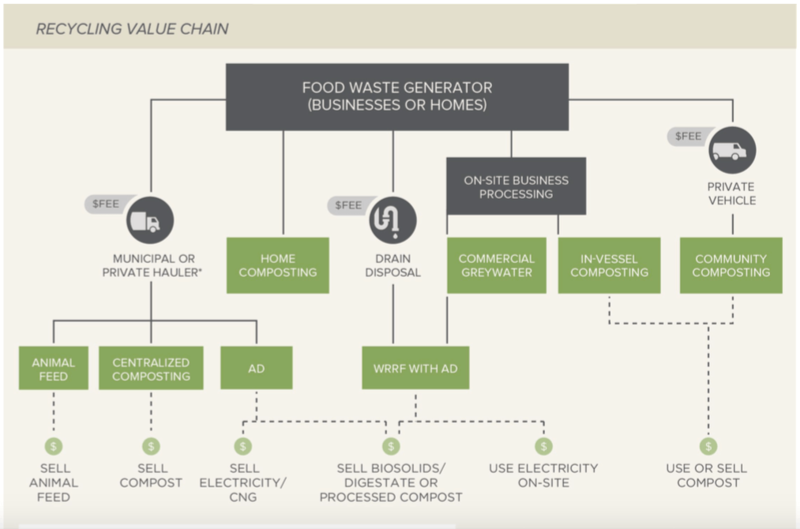 ReFED’s Roadmap shows an achievable path to a 20 percent reduction in food waste within a decade through 27 cost-effective, feasible and scalable solutions that could generate thousands of new jobs, bolster the economy, and divert 13 million tons from landfills and on-farm losses. The Roadmap was developed to identify the most cost-effective solutions to cut food waste at scale, to define research priorities, and to spur multi-stakeholder action. Today, the United States spends over $218 billion – 1.3 percent of GDP – on growing, processing, transporting and disposing of food that is never eaten. Each year, 52.4 million tons of food is sent to landfills and an additional 10.1 million tons remains unharvested at farms, totaling roughly 63 million tons of annual waste. This is not only wasted food, but also wasted energy. Over 40 percent of the energy that we use to produce food goes to waste. Not to mention the detrimental effects that wasted food has on our water supply. The water that is embedded in the food we throw out could meet the household needs of over 500 million people. Then there is the issue of the wasted land. We are essentially trashing our farm lands and pumping greenhouse gas emissions into the atmosphere at alarming rates to grow food that no one eats. We’re contributing to climate change from the comfort of our kitchen waste bins. Meanwhile, as more than 60 million tons of food is thrown out, one in seven Americans is food insecure. ReFED envisions a future where combatting food waste is not only a core driver of business profits but also job creation, hunger relief and environmental protection. The report offers solutions in three key areas. “An ounce of prevention is worth a pound of cure.” Whether in health care, energy or criminal justice, the most efficient way to solve a critical social problem is often to invest in prevention. The same holds true with tackling food waste, where solutions that avoid waste offer the largest social, environmental and economic benefits. Therefore, ReFED argues that prevention should be the first priority for effective management of food waste. Prevention is applicable across the value chain, from farms to homes. The Roadmap shows that prevention creates three times the societal net economic value of recovery and recycling combined. Solutions that prevent waste in businesses and homes have the greatest Economic Value per ton and net environmental benefit, diverting 2.6 million tons of annual waste. The top three solutions with the greatest economic value all utilize prevention: standardized date labeling, consumer education campaigns and packaging adjustments. These solutions require a relatively low investment to provide new information to consumers to shift wasteful behavior. Meanwhile, they avoid large volumes of food from being wasted, leading to high relative savings for consumers. We’ve all seen perfectly good food thrown away at a restaurant, bakery, or dinner party and wished there was a way to get it to people in need. Food recovery captures that food and transports it while it is still edible to help address the issue of food insecurity. Although food recovery initiatives already exist throughout the country, there is a significant opportunity to increase donations. Food recovery networks in the U.S. spanning food banks, pantries, soup kitchens, shelters and other agencies, already receive and distribute nearly 1.7 million tons of rescued food each year. Based on ReFED’s analysis, over three times this amount, up to 5.8 million additional tons, could be feasibly recovered from food businesses in one day. The Roadmap shows how approximately 20 percent of this additional recovery potential, or 1.1 million tons (1.8 billion meals), can cost-effectively be recovered over the next decade. After pursuing as much prevention and recovery as possible, food scraps still inevitably remain. Today, the vast majority of wasted food ends up in landfills where it costs cities millions of dollars per year in disposal fees and rapidly releases methane, a potent greenhouse gas. Yet food scraps are actually a resource that can be harvested to create a closed-loop system that supports a vibrant agricultural sector, energy independence, and greener cities. Centralized composting and anaerobic digestion (AD), as well as a smaller set of growing distributed solutions, will enable 9.5 million tons of waste diversion, nearly 75 percent of the total potential. Centralized composting diverts the most waste, adding over 2 million tons of compost annually to fuel growth in the sustainable farming and environmental remediation markets.